The most unique feature is how Active Minds Learning Camp blends fun with learning experiences. 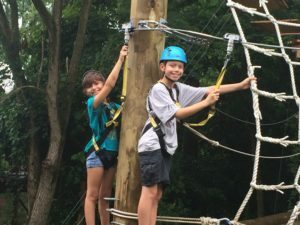 Most summer camps take trips that are simply focused on entertaining kids and are unconnected to any type of learning experience. If they go to the aquarium, kids are simply looking at fish. This is a missed opportunity for children! 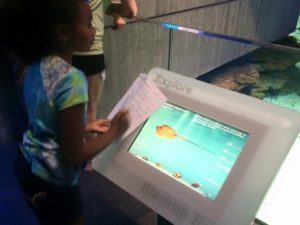 Our experiential learning trips will be anchor activities, linking what children are learning throughout the curriculum to various cultural, historical, and scientific experiences that engage kids in learning. In both 2016 and 2017 Active Minds campers took the ultimate anchor trip for a week focused on leadership: The White House. 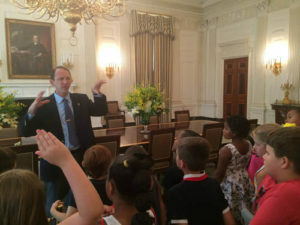 As special guests of the White House, campers got to see where presidents meet with foreign dignitaries, host galas, and even sign legislation. Campers were fascinated as secret service members showed them a painting of George Washington that was cut from its frame by Abigail Adams when they fled the White House as the British marched up to burn it down during the War of 1812. This year, campers will travel back 2,000 years to ancient Rome at The Penn Museum. Campers will see a Roman house that was excavated from the ruins of Pompeii! Real Roman marble sculptures, jewelry, gold coins and technology show how advanced Roman society was for their time. In addition, campers will be grouped into two different learning experiences. Campers in Group A will participate in the Roman Market Place and do as the Romans do by taking part in an interactive ancient Roman marketplace. This workshop highlights social interaction, emotional response and functional mathematics in a simulated marketplace. Students wear togas, handle reproductions of ancient artifacts, and use all their senses to shop the Roman market using differentiated budgets. Campers in Group B will participate in Making a Mosaic and will discover the artistry of Roman mosaics in this hands-on workshop where students learn about the various forms of this decorative art and how ancient artisans created them. Students will work in small groups, then as a class, to create a mosaic comprised of over 4,000 tesserae. The workshop also incorporates geometric equations and binary operations. At camp this week our reading curriculum focuses on foundation skills such as using text features through the DK Eye Witness book series with Ancient Rome and fluency using the level books such as You Wouldn’t Want to be a Roman Gladiator and Who was Julius Caesar? Along with our Anchor Trip of the week we also have an “Active Trip”. These trips are design for kids to have fun, be active, or build important life skills. Some of the trips are specially designed to include all three of these elements. These experiences challenge what kids think they can accomplish both physically and mentally, on an extremely safe course. Specially trained counselors guide kids through both the physical course, as well as the mental team challenges. From building team working and leadership skills, improving self-confidence, and building character these trips make memories that will last a lifetime. The fun doesn’t stop with our two unique weekly trips! Each week we have a third day of trips that allow kids to get out and enjoy summer. 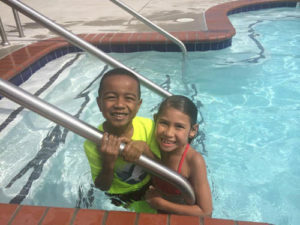 We have partnered with Merritt Athletic Clubs where our campers will enjoy the summer sun in multiple pools with water slides, dump buckets, water cannons, and a climbing wall!